KGI Securities analyst Ming-Chi Kuo, who has provided reliable information about Apple's upcoming product plans in the past, claims that Apple's next-generation iPhone will feature an upgraded Touch ID module with reduced reading errors for an improved and safer Apple Pay experience. "We think the new iPhone,expected to launch in 3Q15, will be equipped with an upgraded Touch ID module, with which Apple (US) intends to offer a better and safer Apple Pay user experience with reduced reading errors. We therefore raise our 2015F shipments of Touch ID module by 12.4% to 262mn sets, boosted by Apple Pay and new iPhone models." Kuo told investors that he expects suppliers to ramp up for production of the improved Touch ID module shipments, which are expected to rise by 77% to over 260 million units, in the second quarter. The oft-accurate analyst added that the upgraded fingerprint scanner will "require more advanced precision for the module’s laser welding process." 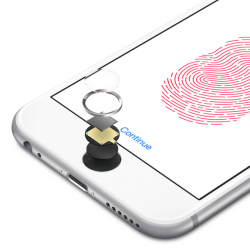 Sunnic and ASE Kuo are expected to be two of the main suppliers of components for Apple's new Touch ID alongside TSMC. Kuo predicts that Apple will release the next-generation iPhone in the third quarter of this year, lining up historically with past iPhone releases in September. Kuo also points out that Touch ID embedded into a display is unlikely in the near term, despite several published patent applications from Apple on the topic. With a need for a sapphire display cover to minimize scratching and the complex algorithms needed for handling Touch ID within a display, it will be some time before such technology is ready for market. how the **** will that work? I don't get it, Touch ID has been working perfectly for me. TouchID already works perfectly for me. And will it come with a better processor and be thinner and lighter too!?! If it doesn't work then you must be doing something wrong. Sorry but don't blame the user when an apple product is not working perfectly. Yes its working for you, but assuming that its perfect and working for everyone else is wrong. iphone 6s to release in Q3, improved camera, improved touchID, improved GPU, improved CPU. These analyst are masters of the secrets. The Touch ID fails about 1/10 the time for me, so I'm all for reduced errors. To all the fanboys above, I use TouchID like 100 times a day, and I get errors very often. The sensor is extremely accurate when working under "normal" conditions. But as soon as you finger is a little wet or dirty, the accuracy drops significantly. So, to my understanding, a better and more accurate TouchID is possible, and this would be a nice add-on. But when your finger gets dirty, it's obstructed from being read by the sensor. No amount of technology is going to fix that.